I remember when I first found out this movie was actually a thing that was happening. It was amazingly sudden, if I recall correctly. I was still fairly new to the internet back in 2001, and the only magazines I read at the time were gaming magazines like Electronic Gaming Monthly, so it’s not like I was exactly up on the latest movie news. So imagine my surprise when I saw several ads and merchandise hanging around Wal-Mart (as it was written at the time) for a third Jurassic Park film that I had never even heard about. Oh my God! We’re going to war with the dinosaurs, and there’s going to be a mini-T-rex! The film starts, and, at this point, I’m super excited! And, once again, we’re treated to a shot of an island — Isla Sorna, a.k.a. “Site B.” So excited! … And then… what… What the heck is up with that cheap, red “RESTRICTED” subtitle? That’s kinda corny, but… okay. … Oh… OH! What is this? What…? 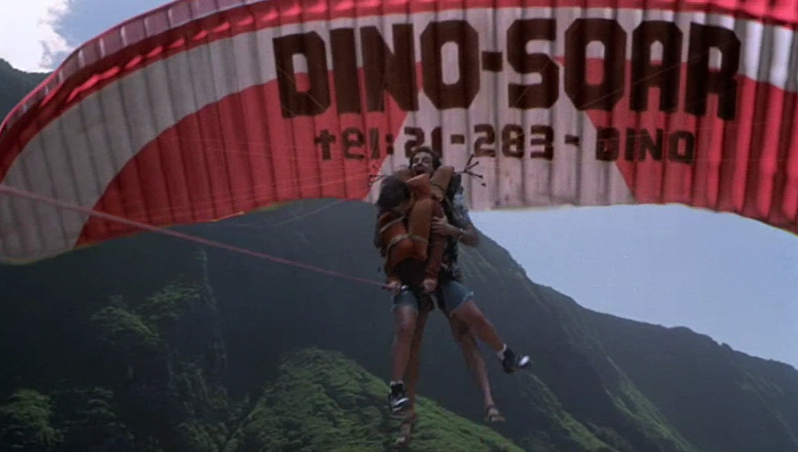 How did they botch the blue screen, or the green screen, or whatever it is they used for the parasailing scenes!? … OH MY GOD, AND THE ACTING! … This kid is worse than Kelly in the last film! What the heck? What’s going on? HOLY CRAP, THEY KEEP DOING THAT AWFUL BACKGROUND EFFECT! Why!? 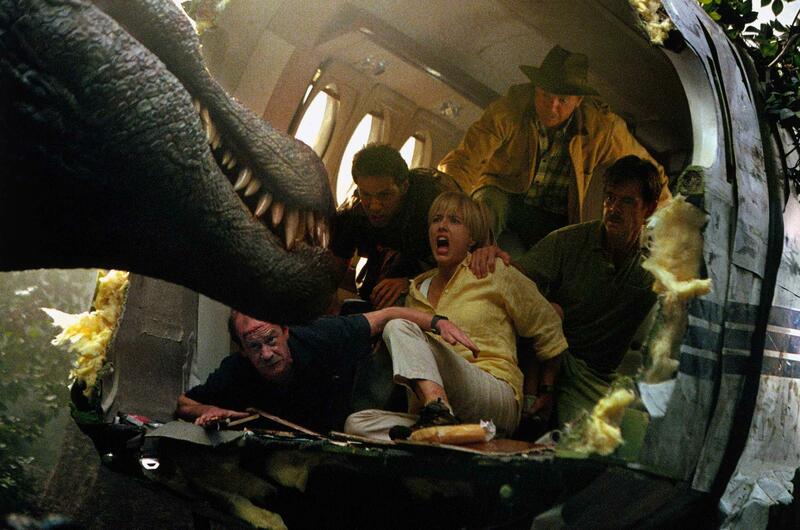 There’s at least going to be a dinosaur scene, right? Dudes in the boat just got eaten. Maybe we’ll see a plesiosaur? … … No? … How long is this? … WILL SOMEBODY PLEASE EAT THESE GUYS ALREADY?! … NO?! … What the hell!? It’s worse in motion, trust me. Needless to say, the film did not endear me right away, much to my astonishment and disappointment. Things didn’t necessarily improve too much from there, either, and it wasn’t long before I started realizing that something was just… off… about the whole production. Sure, we had Dr. Grant back, and, hey, there’s Dr. Sattler, too! — Oh, but it’s only a cameo. — The dialogue was less quippy compared to the second film, too, which, even at this time in my appreciation for the second film, was still a welcome change of pace for me. 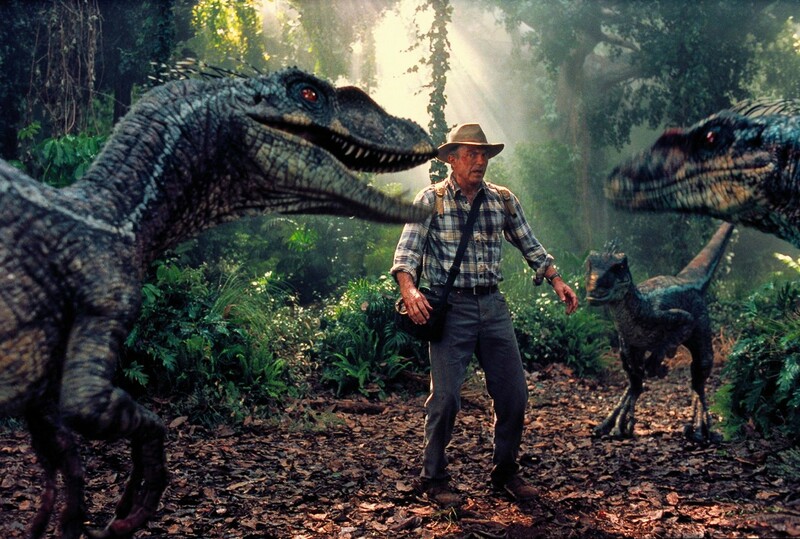 But even more so than that film, Jurassic Park III basically takes the whole concept of wonder and the themes of scientific responsibility and pretends like they barely even exist, though I did like the shout out to the fact that the previous films’ depictions are now outdated — they are mutant creations, afterall. The film, however, delves even further into cheap roller coaster attraction-style thrills that are heavy on chase sequences and light on the smarts. A great part of this is likely due to the fact that Spielberg handed off the directing reigns to Joe Johnston, the man better known for directing the effects-driven minor classics Honey, I Shrunk the Kids and The Rocketeer but also the critical flops The Pagemaster and Jumanji, another large film which also suffered from prominent but awful special effects. With only the family drama October Sky standing as his sole major critical hit, the former effects artist and Spielberg protege was not exactly the most encouraging choice to take over the reigns of the series, and . (It’s worth noting that Johnston has continued to have spotty success, with Hidalgo and The Wolfman both failing to win over critics. Thankfully, he managed to deliver a wonderful Captain America film!) 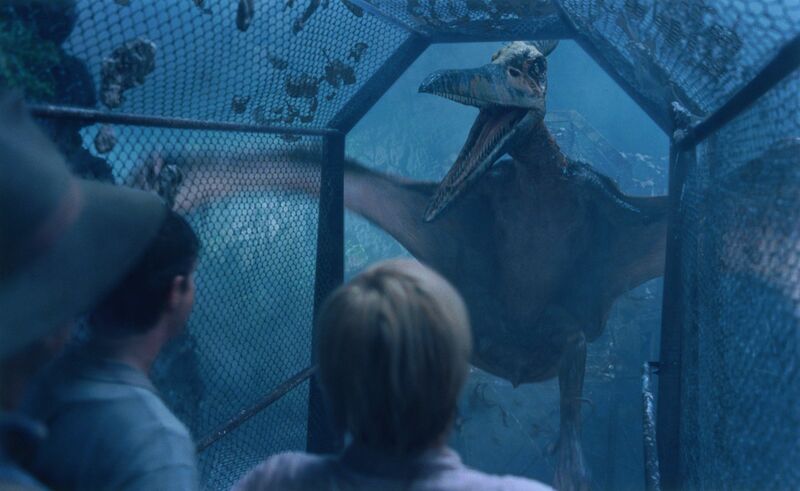 It’s also worth noting that this was the first film in the series to not even be based on a preexisting book, though certain concepts that went unused in the previous adaptations are incorporated here, such as the pteranodon cage. The first film had the family-building element semi-subliminally running throughout, but that was delicately balanced out with the scientific and ethical questions of the whole concept of cloning and fiddling with nature, not to mention that all important element of breathless excitement.There is some subplot about Dr. Grant discovering the extent of velociraptor intelligence and communication, but this is rendered somewhat superficial and unremarkable given the fact that the previous two films already established that these things were super smart and extremely vicious. Do we really need that hammered in a third time in such a silly manner? 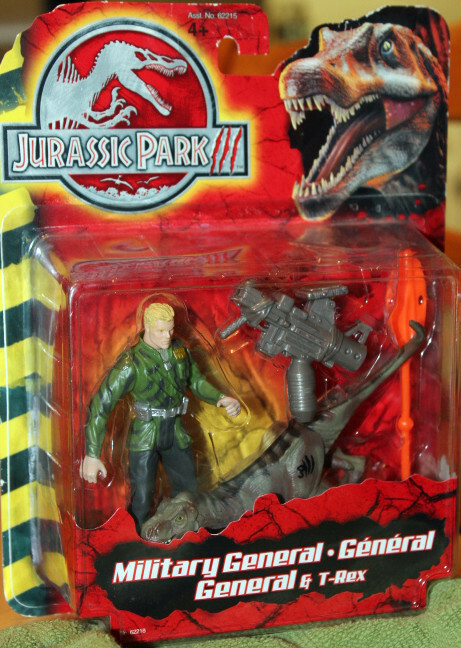 I also suppose that Jurassic Park III is far more self-aware, being more of a theme park ride than the actual attraction this series is centered around, when compared to The Lost World, which helps for those who set their expectations accordingly. We’re given a simple premise — rescue the kid on the island, reunite him with his parents, avoiding being eaten, and get out — and the film should probably be commended for never straying too far from the plot by throwing in lots of stray subplots. Those velociraptor interactions are about all you get. 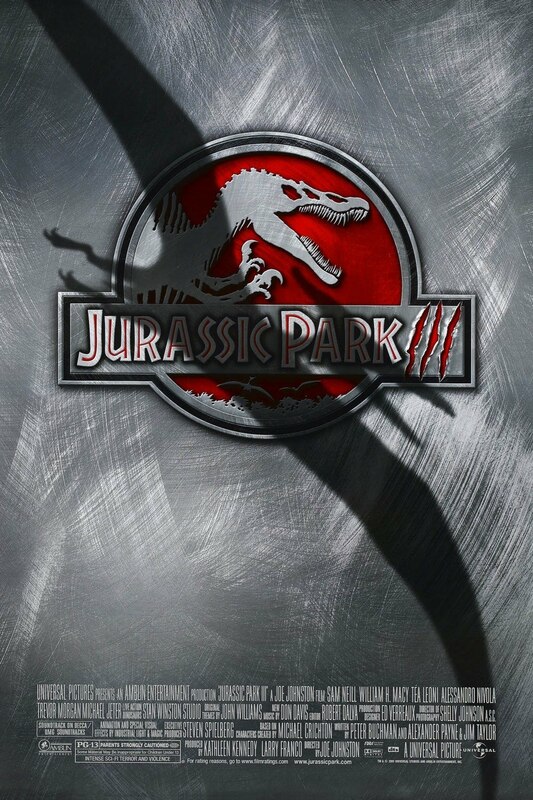 At just about an hour and a half long, JP3 doesn’t overstay its welcome and is a decent enough time killer, but it’s hard to ignore the fact that this was probably the film that made me realize that, most of the time, sequels are nothing but mediocre cash-ins capitalizing on the magic of a predecessor.